The Bayadère (dancing girl) undulates sensually for her audience of one. The Pasha (Turkish military or civil official) watches her, entranced by her suggestive dance. The musician plays intently, accompanying the performer but dutifully casting his eyes away. Is this a glimpse into a forbidden world of Near Eastern carnal delights? Did Roger Fenton luck upon this private scene during his travels in the Crimea? No, in actuality, this photograph was staged in Fenton's studio in London with hired models, and the woman's arms are held aloft by strings to keep them perfectly still. The subject is Orientalist, a term that refers to romanticized depictions by European artists of scenes of Muslim culture in the Ottoman Empire and its territories in the Near East and North Africa. As in this instance, Orientalist scenes were more often fiction than fact. Western cultural biases and misunderstandings were laid down on paper or canvas and frequently became the only source of information in the Western world on the subjects depicted. Few nineteenth-century non-Eastern viewers could dispute their authenticity, since only a small number of them had actually visited such places. 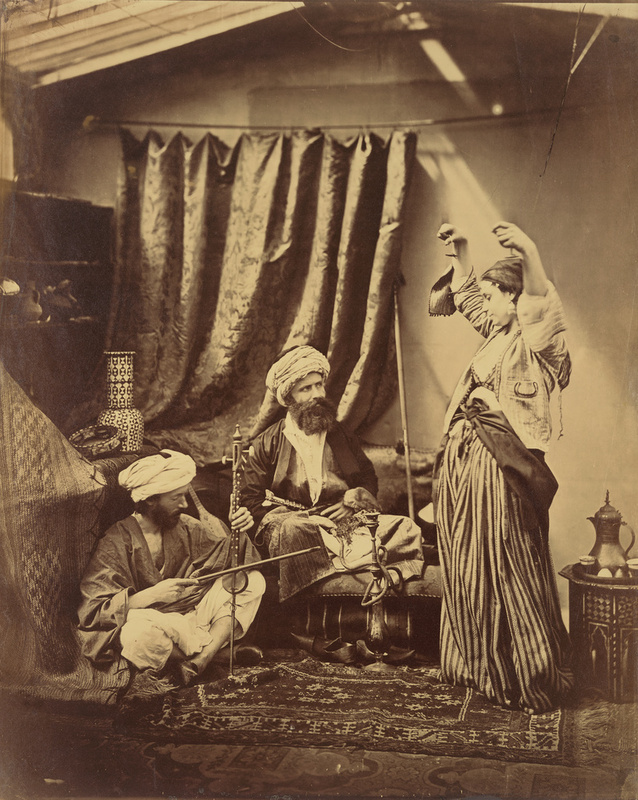 Reviews from 1858 confirm that viewers believed in the veracity of the images; when photographs from the Orientalist suite, including this one, were first exhibited, one reviewer enthused: "[These] are favourable examples, being admirable illustrations of Eastern scenes of actual life." The J. Paul Getty Museum Handbook of the Collections. 7th ed. (Los Angeles: J. Paul Getty Museum, 2007), p. 298, ill.